Playoffs are well underway in the NHL, and aside from the fantastic hockey taking place on the ice, the officiating has been a hot topic of conversation among many fans. 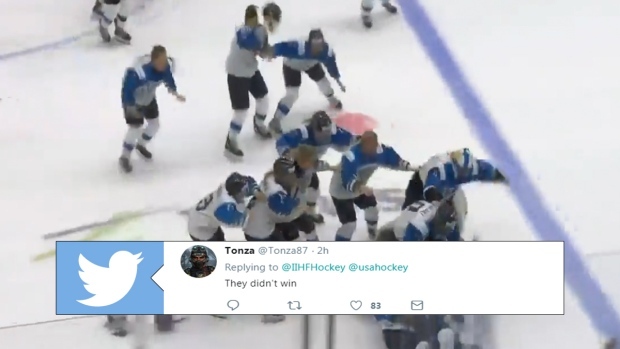 But if you thought hockey fans were furious about calls made in the NHL playoffs, then you have to see the absolute oddity that took place in the IIHF Women's Worlds Gold Medal game in Espoo, Finland. The matchup was a highly anticipated tilt between the host team, who upset Canada to advance to their first ever shot at the Gold, and the USA. It was a back and forth affair that was tied 1-1 at the end of three periods, and required an extra frame to be settled. It was in that extra frame, though, that things started to go awry. It seemed like Finland had ended it. The gloves were off, the sold-out home crowd was celebrating, and the USA had their heads hung. Then, after the longest review we think we’ve ever seen, the goal was disallowed, and a controversial penalty was called. We weren’t the only ones who thought so, and Twitter was absolutely exploding after this call, that eventually ended in the USA winning their fifth straight gold medal in a shootout. How come no-one from your organization is willing to meet the press and give an explanation on why Finland's goal on OT was not accepted??? USA should be embarrassed to take the medal. They did not win. Still no explanation on the call... will we have to wait awhile for you to dream up a believable story? Obviously, most fans are up in arms about this, and apparently, Finland has made a formal protest. Despite the controversial ending, it was an extremely exciting game, and an excellent day for women’s hockey globally.